What makes a food low- or high-glycemic? First off, only foods that contain carbohydrates can be considered low-, medium-, or high-glycemic. Foods such as meats, poultry, fish, and fats (think oil and butter) don’t contain carbohydrates, which means you have to rely on your nutrition know-how to determine what kinds and how much of them to eat. The glycemic level of a food measures how fast that food is likely to raise your blood sugar. A food that raises your blood sugar quickly is considered high-glycemic, and a food that raises it slowly is considered low-glycemic. Foods that fall somewhere in the middle have (you guessed it) a medium glycemic level. Basing food choices solely on the glycemic index can be dangerous because that means you’re only looking at one aspect of food and ignoring other important ones (such as calories, amount and type of fat, and vitamin and mineral content). Many people think that whole grains, fruits, and vegetables naturally fall into the low-glycemic category. That’s what happened during the low-fat craze of the ’80s and ’90s. People started eating fat-free everything, even if it meant higher sugar and calorie content. The same trend is emerging with low-glycemic foods; don’t give in to it! The glycemic index is a great tool, but you also need to make sure you’re eating nutritious foods most of the time and not filling up on candy and chips just because they’re low-glycemic. Don’t toss everything you know about good nutrition out the window. Because the glycemic index deals with your blood sugar’s reaction to various foods, determining a particular food’s glycemic index calls for the help of human test subjects. First, researchers feed 50 grams of available carbohydrates (that’s total carbohydrate minus fiber) to ten or more volunteers to test how the food raises blood sugar levels at different intervals over a two-hour period after it’s consumed. They then plot these changes in blood sugar on a graph and compare the volunteers’ responses to the test carbohydrate to their responses to the same amount of pure sugar or white bread. The average blood sugar response of all ten volunteers compared to their response to sugar or white bread determines the glycemic index of that food item. Researchers use pure sugar for comparison purposes because it’s the simple form of energy used by the human body. However, because most people don’t typically eat sugar all by itself, researchers have also been known to use white bread for comparison purposes. 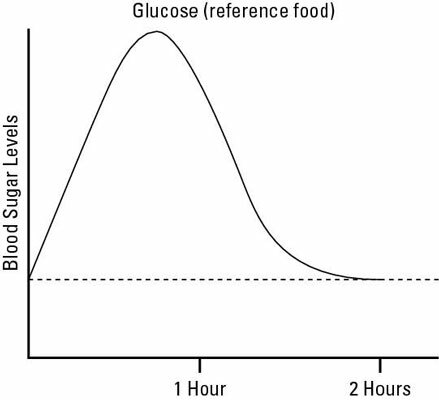 The following figure demonstrates the sharp rise in blood sugar response when pure sugar is consumed. You can see the quick rise and the ensuing drop over time. Notice that the maximum blood sugar spike occurs around 45 minutes. After this peak, the blood sugar levels drop quickly. The next figure shows what happens when a high-glycemic food is consumed. The rise is similar, but this high-glycemic food falls a little short of the curve set in the pure sugar test. 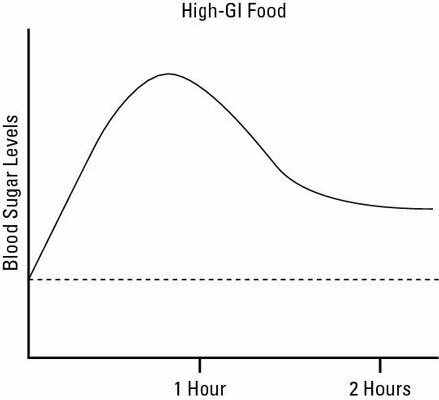 The maximum blood sugar spike from a high-glycemic food occurs around 45 minutes after food consumption, with a fairly quick drop afterward. 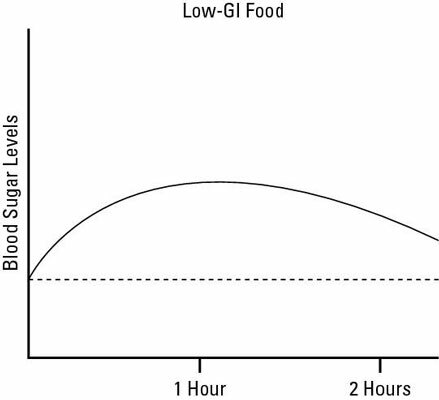 The next figure shows the difference in the curve when a low-glycemic food is eaten. Notice that the maximum spike is much lower and also occurs much later, around an hour after consumption with a slow drop back to the base line. This type of blood sugar response results in lower levels of insulin being released and better control of food cravings, hunger, and mood.